The dollar is low and prices for Paris hotels are high as always. Or...? There are actually quite a number of good hotels at better prices than you'd expect, even under 150 Euros per night (updated, this used to be about Euro 100, but Paris hotels have gotten more pricey in the last couple of years). They may not be as luxurious as Saint Louis Hotel, but they are clean and all have en-suite bathrooms. And if none of these hotels are to your fancy, there's also the nice but rustic Hotel Eldorado or you can find hundreds of Paris hotels at Hotelscombined.com. This hotel offers a lot of bang for the euro. It is situated in the heart of things, near Notre Dame cathedral, the quaint Ile Saint Louis, just across the Seine from major sites like the Louvre, and close to the hip Latin Quarter. But it's also off a quiet side street that provides some sanctuary. The rooms are a bit small with some retro decor, but they do have a bit of character with touches like exposed beams. All in all, a good choice. A simple 2-star hotel that has air conditioning and either a shower or bath. Family run, this central Paris hotel is friendly and gracious. Location is the best selling point for this hotel. Paris' Hotel Britannique is right in the heart of it, just a few steps from the Seine River, Les Halles, the historic Place du Châtelet, the hip Le Marais neighborhood, Notre Dame cathedral and Le Louvre. Once a popular stopover for jazz performers, today this inexpensive hotel features small but atmospheric rooms. This little gem of a Latin Quarter hotel, offers a quiet and refined atmosphere. All rooms have direct telephone, individual safe, satellite TV, mini-bar , marble bath and/or shower with hair dryers. Breakfast can be taken in the garden-courtyard in summer. Although there is no-air conditioning, we recommend this great budget hotel in Paris. The Grand Hotel Leveque is located on the lively rue Cler, one of the last authentic market streets of Paris. All rooms have telephones with a private number, modem jack with direct line, color TV with cable/satellite, air-conditioning available only from June 15 to Sept. 15, a safe and hair dryer. This 3-star Paris hotel is highly recommended because of the value and great neighborhood. Book early; it is a popular hotel. With a great location and a Metro stop mere steps away, this hotel charms budget guests time and again. It's clean and comfortable, and the staff is inviting. In an older building, it is also quaint and charming. No, this isn't the Ritz. But for the price range, these are incredible Parisian digs. With a prime first arrondissement location near the Louvre, the Metro and tons of shopping, this is a great bargain hotel in Paris. While the hotel is aging, its rooms are clean and the staff is extremely helpful. Best of all, the prices start at 69 little euros for a single room. 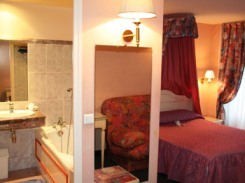 This budget hotel in Paris is located on a small, quiet street and just a two minute walk from the Republique square. Each room offers: cable and satellite TV, iron and ironing board, modem/data port connection, full bathroom, radio, tea and coffee-making facilities, phone, and WiFi. Given the good value and location of this hotel in Paris Marais, we recommend it. The rock-bottom rates for this hotel, in the 50-euro range, are one of its biggest allures. No, it isn't fancy. The rooms are small and a bit dated. 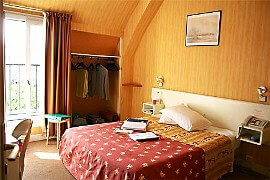 But it is clean, and it has an ideal location walking distance to the Louvre and public transportation. For a true taste of life in Montmartre, this is the perfect budget stopover. It has a fabulous location near the Sacre Couer and Moulin Rouge. They even offer wi-fi Internet service. The rooms might be small, in typical Parisian style, but they are nicely decorated. All this for a pricetag starting at 62 euros nightly for a single. We generally like Ibis Hotels for their clean, simply decorated rooms designed for those on a budget. Located near Place de la Bastille, this is a modern 7-story budget hotel in Paris with Wi-Fi- access and modern bathrooms. Handicapped rooms are available. This is a fine small hotel. Starting at 80 euros nightly for a single, this is a true bargain. It features free wi-fi Internet access. Some of the rooms are surprisingly large, and feature wrought-iron balconies. It's a short distance from the Gare de Lyon train station, making it a great bouncing point for daytrips outside the city. A stone’s throw from the Sorbonne this hotel’s location is convenient to the Latin Quarter. Recently renovated, this little left bank hotel in Paris offers modern and efficiently decorated rooms with all the modern conveniences. Triple rooms are available. Great prices for this fine budget hotel in Paris. 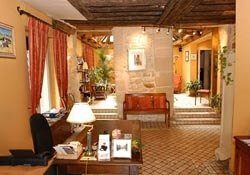 Literally, the name means Hotel Left Bank, and it is well situated near the hip St. Germain neighborhood. The rooms are cozy and atmospheric. It is situated a short distance from the Louvre and the d'Orsay museums, a great choice for art lovers. Some cheap Paris hotels offer a false economy because they’re located in difficult-to-reach suburbs. Not Hotel Opera Vivaldi, though – this hotel has an amazing location just off Boulevard Haussman, home to Paris’s two best department stores, Printemps and Galleries Lafayette. You’re also close to Paris’s beautiful opera house, the Palais Garnier, and Opera metro station. Hotel Opera Vivaldi offers Wi-Fi throughout, air-conditioning and comfortable, modern rooms. If you’re looking for a Paris hostel rather than Paris hotels, the Peace and Love hostel sits opposite Jaures station in the north of the city. Close-by attractions include Sacre Coeur in Montmartre, where you can see the best panoramic views of the city, and Pere Lachaise cemetery, where Jim Morrison, Edith Piaf and Oscar Wilde are buried among others. This friendly and sociable hostel has a pub where you can enjoy cheap beers and cocktails, as well as free Wi-Fi in the daytime and a fully-equipped kitchen. This is a 2-star, budget hotel in Paris that we heartily recommend. The Moulin Vert provides 5 floors of well equipped rooms with bath or shower, direct telephone line, cable TV, mini bar, individual safe, and radio. Reasonably priced continental breakfast is provided in either your room or in the breakfast room. Triple rooms are available and families are welcome. 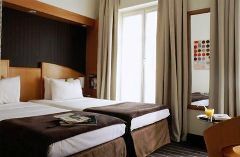 This central Paris hotel features single, double, triple and quadruple soundproof rooms, all equipped with direct dial telephone, individually controlled air-conditioning, desk, radio, mini-bar and cable TV. All the accommodations offer a private bathroom with tub or shower and hairdryer. Non-smoking rooms available upon request. We recommend this 3-star hotel in Paris for its good value. 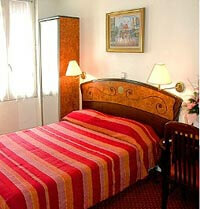 The Utrillo Hotel is conveniently located within walking distance to the Sacré-Coeur Basilica and the Tertre Square. The rooms are fully equipped with TV, mini-bar, direct dial phone, and bathroom including bath or shower. Note: there is no A/C in this budget hotel in Paris. This hotel is cozy and welcoming, even if it isn't luxurious. For the price, it has a fine location and is right on the route of a tourist hop-on hop-off bus. The decor is attractive, and not run-down. The rooms are cheerful, but small. Last updated by Mike on 15 October, 2015 in Lodging. One thing we wanted to add is most of these cheap hotels in Paris offer a complimentary continental breakfast. While this may only include rolls, coffee and juice, it does help when budgeting for your Paris vacation. These are some of the best cheap hotels in Paris, as I have stayed in a couple of them. I am not sure you can really say Paris & Cheap in the same sentence, though it does pay to check these hotels out as you can easily pay much more for less quality. Great list to bookmark away! We will re-post this article on our website as well. Hi Nagaraj. With just a couple of week's advance warning, and you wanting a central location for 4 people with a kitchen, I have to say you're not going to find anything. There are only a few places with kitchens in Paris, and inside the Periferique, there's no chance you'd get this sort of rate. You may consider self catering rentals instead, and I recommend looking at www.holiday-rentals.co.uk or ownersdirect.co.uk for options. You're still not likely to find rates that good during summer, but maybe somewhat close to it with a lot of searching and luck. Am planning to travel to paris on15/06/2012 for 3days and am looking for a hotel room with kitchen fecility and near to central railway station with a family of 2 adults and two kids with a budget below 100euros/night. pl . provide me any one this information. Yes, hotels in Paris are costlier now than a couple of years ago. I updated the price point in the text to reflect that, they seem to be about Euro 150 or so per night to get a good standard for service and amenities. It's a shame they're now so expensive that it's hard to find any good Paris budget hotels. Your list is outdated. Most of the hotels are around $200 mark.